A Bleak Outlook: Will the EU be around in 5 years time? With Western politics becoming increasingly volatile, there is one crucial question to consider: will the European project collapse in the near future? There are a number of events that could threaten the EU’s survival. The two most pressing of these are the potential election of Le Pen’s National Front party in France, and a financial crisis in Italy. This article hopes to gain an understanding of these events, and to analyse their likelihood. When looking at the commentary on the French presidential election, a general consensus can be found. Firstly, Le Pen has a high chance of making it through the first round of elections (as seen below). However, at the second round she is likely to lose either 63:37 to Macron, or 57:43 to Fillon depending on who gets through. Considering the scandals that have recently plagued Fillon, it is most likely that Le Pen will be against Macron in the second round. Her chances of victory therefore look slim. ]There is, however, one thing that these polls are underestimating – abstention. This is the view held by Sege Galam, a French physicist who has created a model to map various election scenarios. Galam previously predicted Donald Trump’s victory when applying this model to the US elections. The fundamental premise of the model is that being behind in the polls does not always translate to a loss on election day. This is due to many people saying they will vote for a certain candidate, yet not actually voting for anyone on the day. Not only does abstention make polling inaccurate, it favours different political views differently. Galam argues that it is highly likely that Le Pen will receive a much higher turnout rate of supporters than either of her main rivals. Similar patterns can be seen in the votes for Brexit and for Trump. Both remainers and democrats criticised their fellow supporters for failing to turn up when it mattered. Therefore, despite current polling data, there is still the potential for an upset in May. The next thing that needs to be considered is the impact a Le Pen victory would have on the EU. Le Pen is undoubtedly against a united Europe with many noting that her anti-immigration rhetoric matches that of former UKIP leader Nigel Farage. However, will her election guarantee a French exit? Unlike the UK, France’s EU membership is written into their constitution. Therefore, for Le Pen to take France out of the EU, a constitutional change would be required. This makes ‘Frexit’ more difficult than many expect, however, it is by no means an impossibility. Assuming that Le Pen is able to initiate a French exit, this is likely to signal the end of the EU purely due to the fact that the second and third largest economies (the UK and France) will have left the EU in close succession. The graph below shows how the EU is heavily dominated by its top five constituent countries in terms of total GDP. 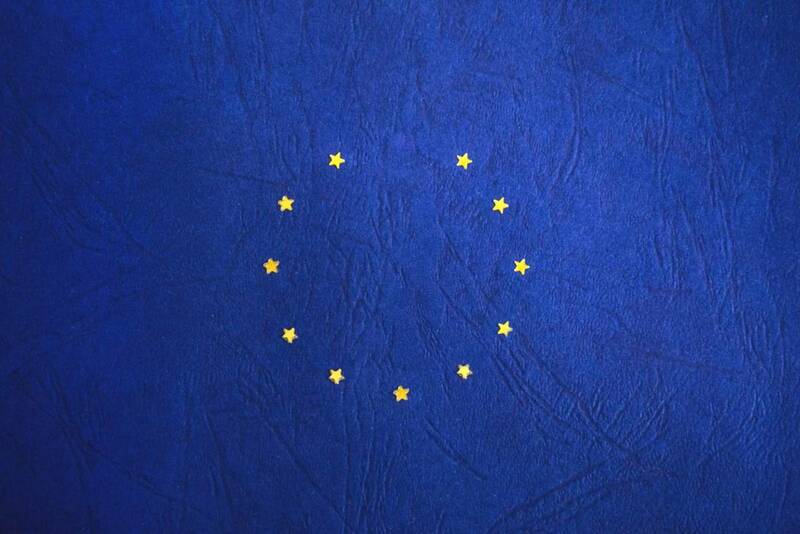 To lose two of these economies guarantees either a complete collapse of the EU, or a restructuring so severe that the EU would become unrecognisable from what it is today. Another threat that is brewing can be found in the banks of Italy. Since November last year, Steven Eisman, who was one of the few to see the sub-prime crisis coming, has been predicting that the next large scale financial crisis is just around the corner. This time, however, its origins are in Europe. The main bank of concern is Italy’s Banca Monte dei Paschi di Siena (MPS). 36% of MPS’s loan portfolio is made up of non-performing loans. This is a worryingly high figure which was largely responsible for the bank coming last in a 2016 stress test conducted on all major European banks. These non-performing loans are a cause for concern as at some point they will need to be written off of the banks balance sheets. In order to do this, MPS must recognise these loans at their true value which is significantly lower than their current value. Doing this “wipes out [the banks] capital, and they go bust overnight”. Whilst MPS is the worst Italian bank in terms of volume of non-performing loans held, it is by no means the only bank that holds these types of loans. It is reported that the Italian financial sector overall has 360 billion euros’ worth of these loans with only 225 billion euros in equity on their books. This means that the whole of the Italian banking system is massively over-exposed to these non-performing loans. It therefore seems to not be a question of will the Italian financial sector fall into a crisis, rather when will this crisis happen. A crippled Italian economy would cause problems for the EU on its own. However, it would be fatal for the EU if it occurred in conjunction with a Le Pen victory. As seen in the graph above, Italy is the fourth largest economy in the EU. Therefore, for these two events to occur, the EU would have lost its second and third largest economies, and have its fourth largest economy in a crisis. 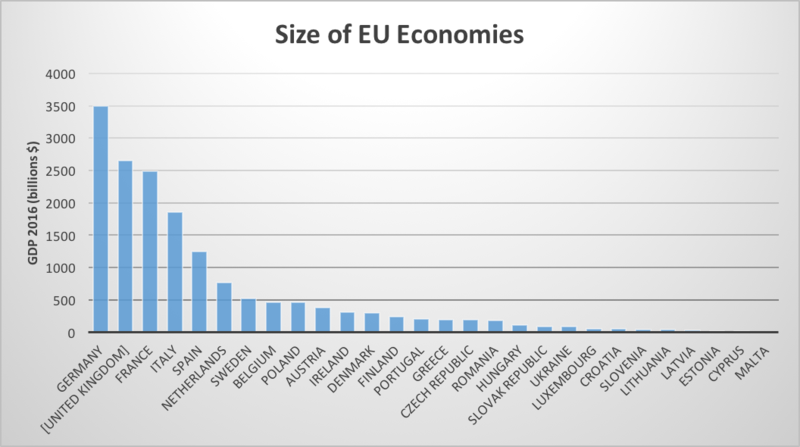 The resulting disparity between the size of the German economy and the remaining EU member states would be a woefully unsustainable situation. Therefore, the future of the EU will be heavily influenced by the upcoming French election, and by the scale of damage that the Italian financial crisis causes.